After our successful outing to Wren Peak, we turned our attention to Tharps Rock in another part of the park. 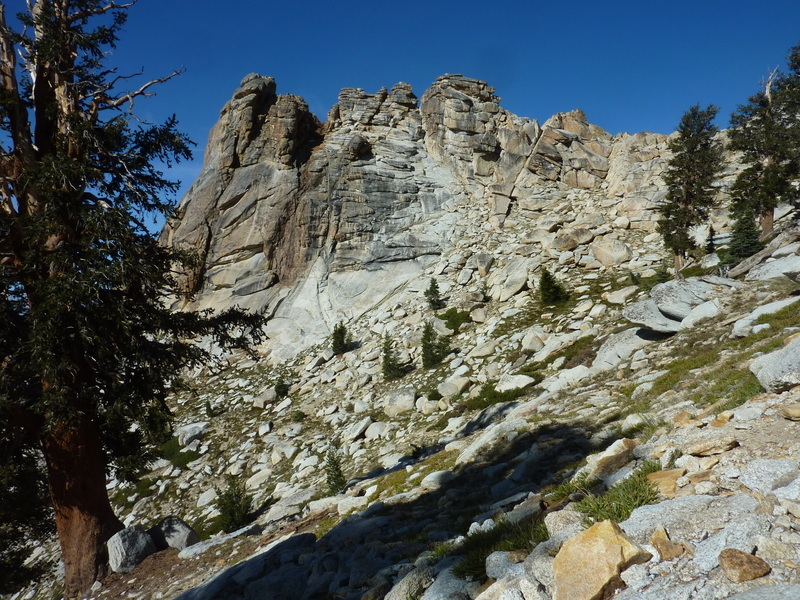 Located a short distance from Alta Peak, it was almost two hours of driving to Wolverton from Cedar Grove in Kings Canyon. The striking formation rises dramatically, overlooking the Middle Fork of the Kaweah River, just off the Alta Peak Trail. One can't help but notice it on the way to Alta Peak, a popular hike, yet there is very little information available on reaching its summit. I had heard that there is a class 4 route to the summit years earlier, but after getting stymied on two visits, unable to find a suitable scrambling route, I concluded it is more likely class 5 and would need more of a siege effort. Others in our group had been similarly thwarted. This time, we'd come with rope, rock shoes and gear to give it a more serious try. We had just enough skill and gear distributed among us to make this work. We'd spent the night at various locations - Matthew off the Big Meadows Rd, Sean, Asaka and Scott at Wolverton, the other three of us off an unsigned road just outside the park. We all assembled at Wolverton in the morning, ready to head out by 7:15a. We spent the first hour hiking through forest to Panther Gap. Another hiker who'd started on the trail just before us, had returned back after the first half mile, having been charged by a mother bear with two cubs. He returned with our much larger group to the bear's location, and sure enough, there was a large black bear looking totally unconcerned by our presence. We talked loudly to the bear, spread out our group to look more threatening, and although the cubs dove for cover in the trees behind mamma bear, she never budged from her position where she was casually digging up the ground or a rotten log or something. We simply walked off the trail around the spot she was holding and left her and her cubs to that part of the trail. At Panther Gap we were treated to a fine view of the Middle Fork drainage with the impressive Castle Rocks across the river. There was some talk about visiting those someday, but that would require far more work than today's effort. From Panther Gap the trail traverses high on the north side of the canyon with great views as it travels alternately through forest and more open chapparal. We paused at the end of the second hour where the trail goes by a large granite block I dubbed Warmup Rock. At first it appears to be a difficult climb, but there is a class 4 route up one corner that a few of us gave go at. It was a neat little exercise that had good holds to compensate for the exposure, allowing four of us to climb up and down before we continued on. Another 20min along the trail brought us to the east side of Tharps Rock where the trail passes closest, only a few hundred yards away. We left the trail here, traversing open slopes and climbing some class 3 slabs to make our way to the first of two notches. The second notch, immediately to the south, is reached via more class 3 scrambling. Here one is confronted with the 20-foot overhanging headwall that stops one from reaching the highpoint. A short distance down a gully to the east is an alcove and a 35-foot chimney that would be our route up Tharps. I had examined this on my second visit and even scrambled up it about 10ft before retreating, finding the upper moves harder and the exposure more concerning. As is my usual practice, I tried to see who else I might coerce into leading the route, but found no takers. Sean, Matt and Asaka were all new at this while Matthew, Iris and Scott all declined. Rats, I would have to get on the sharp end. The others were spread out in the alcove, some in the shade, others in the sun, Asaka and Sean on the rocks above, all prepared to watch the show. With Iris belaying, I slowly went up the chimney and in about five minutes' time I had placed two cams for protection and had only about 12ft left to the route, but it was here that my progress ground to a halt. The cracks that had worked so nicely to this point more or less ended and the headwall seemed beyond my abilities. There was a thin ledge to the left that went around a corner and I thought I could probably rest there and maybe see if there was an easier route that we couldn't see. With some effort I made it to the ledge, let my shakey legs recover while I photographed the peanut gallery below and above me, then went around the corner to explore. I found the sloping shelf continued some distance, but it eventually came to a dead end and back I went. Sitting there with the others below me, I couldn't see a way past the crux. Scott eventually piped up that maybe he'd give it a try and I was more than happy to let him. To facilitate a change of leaders, I first set up an anchor where I sat on the shelf. Scott then tied in to the rope around the halfway point and had two belayers to help him up the chimney. Once there, he examined his options and we had a short discussion. "Why not just stem up this way?" he asked. I had to admit I had far less flexibility with my age and stemming was not one of my strong suites. "I love stemming!" he enthusiastically rejoindered, and with no shortage of spiritedness, finished off the crux in fine style. Success! Or sort, of anyway. We had one guy up. The next problem we realized was that Scott had never led an alpine climb before, not placed a piece of gear or set up an anchor, the latter of course being necessary before we could get anyone else up the route. Luckily he owned plenty of gear that he'd played with and had the basic ideas already rolling around in his head, and with a little coaching from below he was able to set three pieces of gear up for an anchor and tie himself in. The next part of this effort was to get me off my shelf and up to join him. I proved my stemming skills to be about as weak as they were claimed to be and struggled mightily at the crux despite the comfort of a rope above me. In the end I had to aid on the rope and partially pull myself up - no claim to fine style points for me on this one. Once seated next to Scott, I checked his anchor, added another cam I had with me, and clipped in with a cordelette I equilized between three of the anchor points. We now had two belayers on top ready to bring up the other five of our crew. Matt was on a critical time schedule that needed him back in LA in time for an evening show he was to attend with his mother. To help expedite his departure, Scott belayed him up first, Matt went and tagged the summit and signed the register I'd brought up with me, then we lowered him back down the route the same way. He gathered his gear and bid us goodbye before disappearing back down the slabs. Scott and I then took turns belaying the other four up the route, first Sean, then Asaka, followed by Matthew and Iris. Easily the heaviest in our group, Sean was the only one to slip on the route, taking a short fall at the crux that brought his full weight on the anchor with me attached. I slipped only a few inches, friction in my pants, the anchor system and rope over the rock all combining to hold him nicely. He'd end up with some nice scrapes on one of his legs and a few skipped beats in his heart, but otherwise no lasting damage. Once everyone was up, Scott and I disassembled the anchor, coiled the rope and joined the others about 30yds up at the highpoint. It had taken several hours to complete the climbing portion, no speed record to be sure, but at least we were all safely up. We spent probably 20min or so at the summit taking in the views and leaving a register where there was none to be found, before working out a descent plan. I concluded the easiest way down would be at the overhanging headwall, just a short drop down to the notch below. I threaded a long stretch of webbing around a large block to rappel from, attached the rope and went down first - as I told the others, it's always a good form to make the guy who sets up the rappel be the one to test it first. The others came down in turn, some in better style than others, mostly determined by how much or how little practice each had had at rapping. It was 1p before we had changed back to our boots and put away the gear, having spent about three hours on the rock climbing portion of the day. While the others headed off to climb Alta Peak as an easy bonus peak, Matthew and I headed back. We'd already been to Alta on previous occasions and felt no need for another visit. With some coaxing, I got him to agree to drop down the west side of Tharps from the first notch as a shorter route back to the trail. "You know, I don't like slabs any more now than I did when I first met you," he lamented. I enthusiastically pointed to a series of grooves that allowed us to avoid most of the steep slab portions and before we had gotten to the bottom he admitted that it had been a good choice to go this way. Once back on the trail I spent the rest of the time trying to keep up with Matthew's quick pace. He looks like he's traveling at a leisurely pace, but I found I had to jog periodically to catch up as I would slowly fall behind. Two hours later we were back at Wolverton. As it was only 3p, I wanted to find something else to occupy the afternoon since I was going to spend another day in the area. Matthew seemed to be interested in my idea of visiting Chimney Rock, but in the end decided to start the long drive back to the Bay Area.